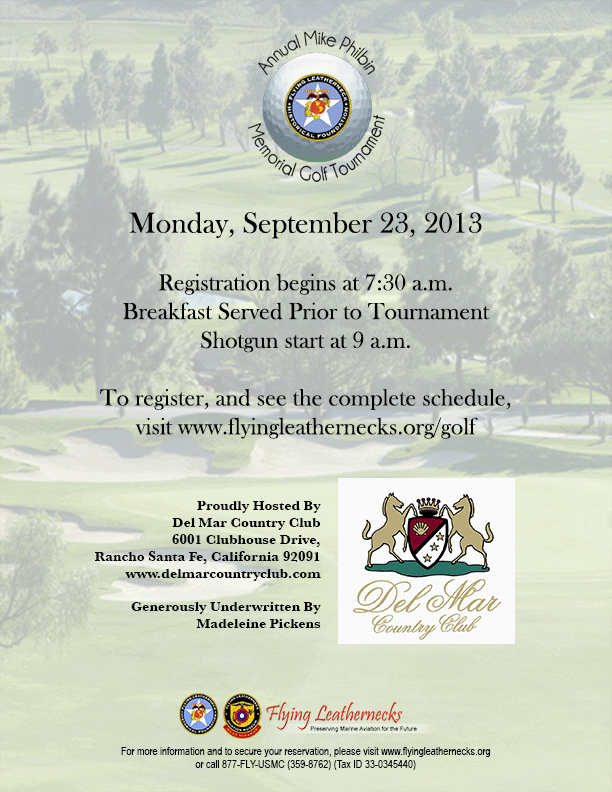 The Flying Leatherneck Historical Foundation will hold its Third Annual Mike Philbin Memorial Golf Tournament graciously hosted by the Del Mar Country Club. Golfers who attend this year, will have the chance to golf with two Medal of Honor recipients - and surprise celebrity guests! Every year, the Flying Leatherneck Historical Foundation golfs at the Del Mar Country Club, to raise funds for the restoration of their aircraft, and the education programs they fund. The Mike Philbin Memorial Golf Tournament was named in memory of Michael Patrick Philbin, of San Diego, who was a key member of the Flying Leatherneck Historical Foundation's board of directors. Mike was born in Philadelphia, Penn. in November 1946 into a Marine Corps family. His dad, who had served in China in the late '30s, was a career Marine retiring as a Mustang Captain in 1962. He grew up as a Marine "brat" living in Perris Island, Camp LeJuene (twice), El Toro, and San Diego. He attended San Diego State University majoring in marketing and joined the Marines in 1968. For registration and full list of the day's schedule, please visit http://www.flyingleathernecks.org/golf. The Foundation actively supports the operation of the Marine Corps Air Station (MCAS) Miramar Command Museum (Flying Leatherneck Aviation Museum) located on MCAS Miramar. We accomplish the mission by providing a volunteer base to support day-to-day operations and by providing financial support to augment austere DoD budgets. The Flying Leatherneck Aviation Museum (FLAM) has undergone a rigorous certification process and is one of only three certified Marine Corps Command Museums. The FLAM is the only museum in the world dedicated to the primary purpose of preserving the history of U.S. Marine Corps aviation and boasts a collection of more than forty vintage aircraft, a library with extensive research materials, photos, video, valuable memorabilia and artifacts.